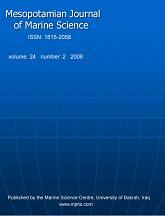 Formerly: Marina Mesopotamica ; Publisher: Marine Science Centre, University of Basrah ; Founded: 1982 ; ISSN: 1815-2085 ; Language: English and Arabic ; Paper Size: 185 x 227 mm ; Issues: Two per annum ; Number of articles: Approximately Ten per issue ; Abbreviated Title: Mesopot. J. Mar. Sci.##### Mesopotamian Journal of Marine Science (MJMS)publishes full-length articles, short communications and reviews in English and Arabic language. Applied science papers are especially welcomed. Manuscripts submitted are read critically by at least two peers selected by the editorial board. مجلة وادي الرافدين لعلوم البحار مجلة علمية محكمة نصف سنوية تصدر عن مركز علوم البحار، جامعة البصرة. صدر أول مجلد لها سنة 1982. تضطلع المجلة بنشر النتاج العلمي من البحوث والمقالات باللغتين العربية والانكليزية، كما ترحب بنشر الابحاث التطبيقية. ترسل الابحاث إلى محكمين أثنين تختارهما هيئة التحرير. Marine Science Fields (Aquatic Biology, Marine Environmental Chemistry, Marine Geology, Marine Physics and Fisheries Sciences). مجالات علوم البحار (أحياء مائية، كيمياء بيئية بحرية، جيولوجيا بحرية، فيزياء بحرية ومصايد).